In the 17th century a London physician, Dr. Thomas Willis, determined whether his patients had diabetes or not by sampling their urine. If it had a sweet taste he would diagnose them with diabetes mellitus- “honeyed” diabetes. This method of monitoring blood sugars went largely unchanged until the 20th century. Then in 1921 something truly miraculous occurred in Ontario, Canada. A young surgeon Frederick Banting, and his assistant Charles Best, kept a severely diabetic dog alive for 70 days by injecting it with a murky concoction of canine pancreas extract. With the help of Dr. Collip and Dr. Macleod, Banting and Best administered a more refined extract of insulin to Leonard Thompson, a young boy dying of diabetes. Within 24 hours, Leonard’s dangerously high blood sugars had dropped to near normal levels. Until the discovery of insulin, most children diagnosed with diabetes were expected to live less than a year. In a matter of 24 hours the boy’s life had been saved. News of the miracle extract, insulin, spread like wildfire across the world. Since insulin’s discovery, medical breakthroughs continued to prolong and ease the lives of people with diabetes. In 1935 Roger Hinsworth discovered there were two types of diabetes: “insulin sensitive” (type I) and “insulin insensitive” (type II). By differentiating between the two types of diabetes, Hinsworth helped open up new avenues of treatment. In the 1950s, oral medications-sulfonylureas were developed for people with type II. These drugs stimulate the pancreas to produce more insulin, helping people with type II diabetes keep tighter control over their blood sugars. In the 1960s urine strips were developed. Dorothy Frank, who has had type I diabetes since 1929, remembers, “In order to test your blood sugars there were these do-it-yourself urine kits-blue meant there was no sugar present, and orange meant you were positive.” With the invention of urine strips, it was no longer necessary to play chemist, with a collection of test tubes lined up on the bathroom sink, waiting for the results. Since then, new technologies have brought us glucose meters the size of calculators that can be easily carried in a pocket or purse. Thankfully, the days of hefting around a three pound glucose meter are over. Luckily, technology has allowed for great leaps in pump design. The pumps of today are light and compact and can easily be carried in a pocket or clipped to a belt. In 1979 Derata released the first needle-free insulin delivery system-the Derma-Ject. It weighed 1-1/2 pounds and cost $925 dollars. The Derma-Ject carried the insulin on the side and had no pressure adjustment feature. One early user of the Derma-Ject decided not to use it after a month because it gave him such a terrible jolt every time he used it. Thankfully, modern needle-free injectors have adjustable pressure, so they are relatively pain free. In addition, the newer models are light and compact in comparison to the heavier models of the ’70s. The hemoglobin A1c test was devised in 1979 in order to create a more precise blood sugar measurement. With the A1c, hemoglobin, the oxygen-carrying pigment in red blood cells, is used to track glucose changes over a period of four months, the life span of the cell. Hemoglobin links with the glucose in blood; the more glucose present, the greater amount of hemoglobin linked with glucose. The A1c became a standard measurement for blood sugar control in the comprehensive ten-year study from 1983 to 1993-the Diabetes Control and Complications Trial (DCCT). With the conclusion of the DCCT in 1993, studies showed that people who were able to keep their blood glucose levels as close to normal as possible had less chance of developing complications, such as eye, kidney and nerve disease. Before this, many doctors had not put much emphasis on tight control of blood glucose levels. The common belief for decades was that diligent monitoring of blood sugars and intensive insulin therapy had little consequence for people with diabetes. Since the DCCT’s findings, statistics have proven that tight blood glucose control can be extremely beneficial for people with diabetes. In May of 1995, Metformin, an oral medication for people with type II diabetes, was finally approved for use in the United States by the FDA. Unlike sulfonylurea drugs, which stimulate insulin release, Metformin does not increase insulin production. Instead, it heightens sensitivity to insulin and increases the muscles’ ability to use the insulin. Since Metformin promotes weight loss, decreases hyperglycemia, and improves lipid levels, it has been shown to be an effective tool for people with type II diabetes when used in conjunction with sulfonylureas. Precose, an oral medication, was approved for use by people with type II diabetes in September 1995. Precose delays the digestion of carbohydrates, thereby reducing the sudden rise in blood glucose after eating a meal. Precose can be used in conjunction with diet to lower blood sugars in people with type II whose glucose levels cannot be regulated through diet alone. Lispro, a new fast-acting insulin, was released in August of 1996 by Eli Lilly under the brand name Humalog. Lispro is designed to simulate the body’s natural insulin output. Because of lispro’s fast-acting tendencies, patients can take this insulin 15 minutes or less before eating a meal, instead of waiting as they would with Regular insulin. Three thousand years have passed since Aretaeus spoke of diabetes as “the mysterious sickness.” It has been a long and arduous process of discovery, as generations of physicians and scientists have added their collective knowledge to finding a cure. 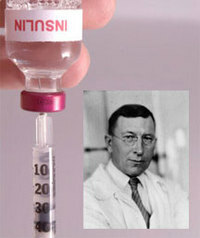 It was from this wealth of knowledge that the discovery of insulin emerged in a small laboratory in Canada. Since insulin saved the life of young Leonard Thompson 75 years ago, medical innovations have continued to make life easier for people with diabetes. As the 21st century rapidly approaches, diabetes researchers continue to pave the road toward a cure. Today, it is unclear what shape the road will take; perhaps another dramatic discovery like insulin waits around the corner, or possibly researchers will have to be content with the slow grind of progress.